Now if you have not heard of them, or it isn’t patently obvious, California Closets is a company that makes organizing solutions for closets and pantries. The irony of “organizing solutions” does not fail to strike me. First we are trained to consume, literally trained, a ‘go hunt for deals’ mentality, and then, when our crap threatens to overwhelm us, someone else comes along and sells us crap to store our crap in. The irony, the irony! It’s literally crap on top of more crap! Irony aside, when you have too much stuff, you need to find/create places to put it. I will use another entry to make suggestions on how to reduce that pile into what REALLY should be kept and instead focus this entry on what to do with what you are keeping. My family has been recycling for a while now, and that recycling, the act of sorting the tin, plastic, glass, and aluminum from what had previously gone to landfill is a vision I firmly have in mind when I urge you to reuse, repurpose and recycle. Call them the three R’s. Say you go out on a hot day and exercise, and purchase a bottle of Gatorade. Drink it down, rinse it out, and cut the top half of the bottle off and put it in the recycle. The bottom half can be a seat for a toilet brush, or it might hold makeup brushes in your medicine cabinet or pins or buttons in your craft area. Keep your shoes clean and free from dust by putting them inside of their shoeboxes (or another shoebox) and labeling the outside with a description. Or you can take a picture of each pair of shoes, pick up the prints and tape them to the outside end of the box for easy storage. When my maternal grandmother passed away in 2001, I quickly realized how much of an impact her thriftiness had on me. Not just that, her storage solutions were immaculate, beautiful things. Old beach bottles cut down to hold sundries underneath the bathroom sink, a cut down quart milk carton wrapped in leftover wallpaper proudly held her makeup (and matched with the decor). She had grown up in the Depression and hated to waste anything. Coffee cans, empty and clean, lined shelves in the basement, waiting to be re-purposed. I have taken her example to heart. Everything still goes to the recycle bins, which are located in a neat little row outside of our kitchen in the garage. I consider them ‘potential supplies’ and pick from them when I have a need. Tin cans are used to start seedlings in the early spring. 2-liter plastic bottles often come in handy for watering remote areas of the yard (just poke a couple of small holes in the bottle, fill up the bottle with water and partially bury it near the plant that needs water, it will slowly seep into the soil). Even furniture can be reused and repurposed. I get the RSS feed from DesignSponge and it is full of daily ideas that include re-making tired old furniture into kitchsy, storage solutions. Take a look here at one of their recent re-purposing projects. And another is here. No matter how you go about recycling, reusing and repurposing…have fun. There are so many things we can do with the items already in our house (or available for free on curbs) to better organize ourselves. Don’t be afraid to pull out a saw, a hammer, and some cast-off cans of paint or wallpaper remnants. What you will end up with will be uniquely yours, and far more personable than any humdrum purchased ‘organizing solution’. This post comes to you straight from my treadmill – in fact I’m typing as I walk a steady 2.3 mph. It’s the beginning of the year and how many of us have vowed to get in shape, lose those love handles, and start eating healthier? Plenty, I’m sure, including me. 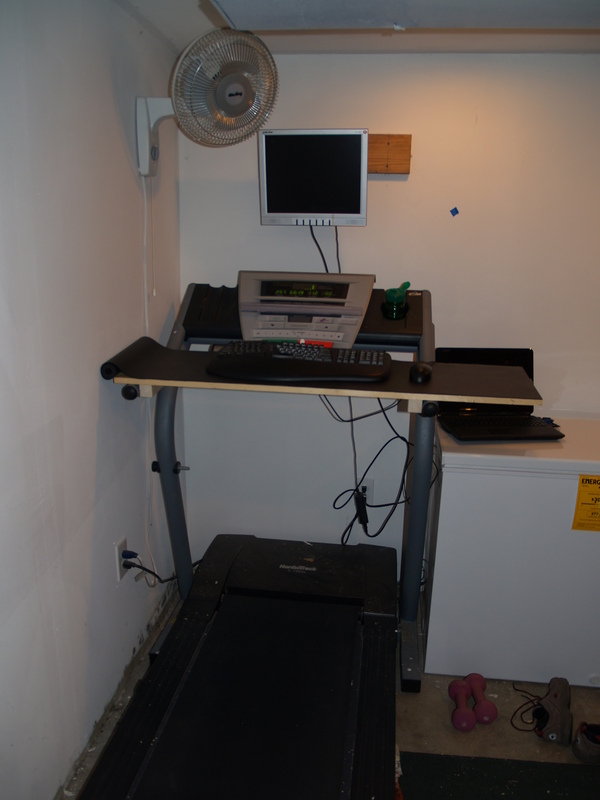 That’s when a very clear vision hit – I had seen it months ago on Instructables.com, where someone had added a keyboard table to their treadmill. 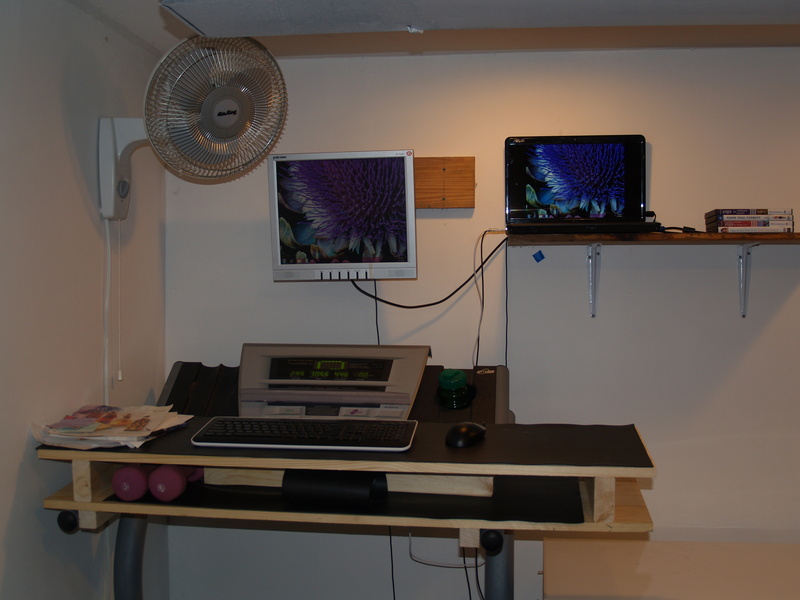 I looked at the setup and I could see it – laptop sitting to the side of the treadmill on the chest freezer, external keyboard and mouse on the ‘table’ that would rest on the treadmill handlebars, and the external monitor hanging at eye level on the wall. It was perfect. I also knew it would help me cut down on my inefficiency when sitting at the computer (I tend to go on tangents, check Facebook and the newsfeeds obsessively) and, the best yet, I could increase my blog posts. Now that I have twelve different blogs to maintain, I need all the help, and the time I can find! This is day two of my exercise regimen and I just looked down at the clock to realize, to my dismay, that I must finish this post in less than six minutes. I’ve been walking, and researching, and surfing, and blogging for over 54 minutes now! So the setup is not difficult. Use an old computer that takes time to boot up, or use a laptop that has a wireless connection to the internet. I highly recommend that you have at the very least a external keyboard and mouse. The laptop could sit on a shelf above the treadmill on a wall, but trying to just use the built-in keyboard could be problematic. My treadmill is here in the basement, near our washer and dryer. I placed all of my workout clothes here on top of the dryer, shirts in one pile, pants in another, with the workout socks in between. My tennis shoes sit here next to the treadmill. In the morning, at the ungodly hour of 5 am, you will find me here. I get up out of bed, do a weigh-in, come downstairs and pull on my work out clothes and get to exercising and surfing and writing. When my hour is up I pull off the clothes, add them to the pile waiting to be cleaned, and often start a load, transfer the clothes over or even take a dryer full of clean clothes up to be sorted and folded and put away. I’m now at 65 minutes of exercise, so I’ll close with pictures of my setup. Happy Organizing! The other day I presented my class proposals to the Mid-Continent Public Library’s bi-annual meeting. Librarians from all 22 branches were in attendance and the coordinator gave the following introduction to the group. I get that from a lot of people. The ‘tired’ part, that is. The thing is, all of those things I do, happen one at a time with very few exceptions. For example, right now I have set my two writing projects on hold in exchange for two very time-sensitive projects…a king-size quilt I am making for my oldest daughter’s visit and birthday this fall and the quintupling of my raised garden beds with cool season vegetables to be planted as soon as I have dirt in them. I want to have the quilt done by the time Dee arrives in September and I can manage a crop of potatoes, cabbage, kale, beans, peas, zucchini & carrots before frost hits if I have the seeds in the ground by next weekend. Part of me wants to dig out three other quilts that have been started but never finished. But those will probably wait until winter when I can’t garden! The book-writing is also a priority, but I think that, in a week, I will be able to return to them (one or both, depending on mood) and make significant progress. Cropping up in my range of ‘priorities’ is the concern that my little one, nearly three, is lonely. So I’ve scheduled in daily kid activities, which usually entails dropping her off with kids her size at the community center and working out for an hour while she is having fun. I can actually do this up to nine hours a week if I want, since there are multiple activities available. This also fills another ‘gotta do’ in the exercise/weight loss department. So many times in life we want it all, right now, and next week, next month or next year feels like forever. I have some beautiful bearded iris that I planted in my garden over a decade ago. I remember thinking that cool fall day that spring couldn’t come fast enough, I wanted to see them and cut them and put them in a vase on my dining room table! Ten years later, I’ve dug and divided them up twice and given away more plants than I ever originally bought. Life is like that, we turn around twice and wonder where the heck five years went. Or ten, or thirty. I realized about five years back that I wanted to see and experience quite a list of things. I wanted to learn, grow, dabble in a wide range of interests and that I had a lot I wanted to get accomplished! Not everyone has the same mental list ticking away in high gear in their brain. And that is fine, perfectly fine as a matter of fact! What level of activity/interest do you want? What ARE your wants or needs? Find that acceptable level and go forward. And don’t worry about what others think. There are times when my desk looks like a hurricane hit it. There are days, even weeks, when my house is well overdue for a thorough dusting and vacuuming. In fact, it’s in dire need of vacuuming right now. I’m choosing to wait on that until later today. I have this post to make and I also need to build some raised planters and will probably end up tracking through the house if I vacuum now so why bother? I’m not perfectly organized all of the time. My house is not neat and clean at all hours, ready and waiting for the surprise visitor. I have a preschooler for goodness’ sake! No one can keep up with her! Everything I do, all that I do, still happens one thing at a time. I give up one thing, clean floors, in order to clean the garage or work on a quilt. I do this happily. I sacrifice order for progress or learning and I sacrifice cleanliness for experience – not every day, but enough of the time to never know quite what you will find when you walk in my house! It’s hard to juggle priorities. Some days I’ve just had it, and then some, and it is easier to simply sit and read or zone out in front of the tv. So what is this post all about? I guess I’m simply trying to point out that I’m not Wonder Woman. I do what I can, when I can, with whatever is within my means. And so should you. Don’t aspire to be anyone except yourself. Find your comfort level and to heck with what the rest of the world thinks. It’s your life after all. I just wanted to post a reminder to everyone that “Change Your Life” class is being held today at 10am-12pm. I’ll be reading excerpts from my book in progress and giving great tips on how to begin changing your life today! It’s FREE to attend, there is no sales pitch, and everyone who attends receives a free 50-minute coaching session. What do you have to lose?! I’ve recently been playing with my account on Mint.com and although it has its limits, it is very impressive. For those of you who are unfamiliar, Mint is a web-based application that tracks your finances – everything from your mortgage, credit cards, and spending habits – for free. I still think that everyone should have a copy of Quicken or Microsoft Money, but in a pinch Mint can do a lot for you as well. We do not need any personally identifiable information from you to set up your account. We only ask for a valid email address, password and zip code. We ask for your online banking user name and passwords, but we do not see or store that information. That means no one at Mint, and no potential hackers of Mint.com, can access your banking credentials. We connect securely to your financial institutions using one or more online financial service providers. Your online banking credentials are stored only with these institutions enabling Mint to automatically and securely update your transactions and saving you from updating, syncing or uploading financial information manually. Mint provides bank-level data security for the transaction information we store. Mint uses 128-bit SSL encryption to ensure that all communications between your browser and our Web site are secure. We store transaction information in a secure facility, on our own servers, protected by 24/7 security guards and biometric scanners. All Mint employees pass financial and criminal background checks as a condition of employment. Mint.com has received the VeriSign security seal and is tested daily by Hackersafe. Mint’s privacy protection standards are certified by TRUSTe. Mint’s anti-phishing protection is provided by RSA Security, Inc.
Mint does not know your bank account numbers or credit card numbers. Mint uses only your account login credentials for access to your account information and Mint does not store these credentials. You cannot move money with Mint. Mint offers valuable insights and analytic tools to help you better understand your money…but Mint is a “read only” service. Meaning: you can view and organize your money with Mint, but you cannot move money between—or out of—your bank, credit union or credit card accounts. As I mention in my classes – knowing how much money is coming in, going out, and your overall financial bill of health is incredibly important. Every day I meet individuals who have no idea how much the spend on eating out each month, on utilities, clothing, et cetera. I also meet business owners who think it is too much of a bother to log how many miles they drive for business. When I showed one business owner how she could write off over $2,000 in business income just by tracking her miles, she became an instant convert. If you don’t have one, create a simple budget in a spreadsheet program like Excel. List your potential expenses and take a long look at each of them, where can you save some money? If you don’t use your cell phone much, consider switching to a pay-as-you-go service. We recently switched to T-Mobile and for $260 have two phones and enough minutes to last us for up to a year! That’s a savings of almost $60 per month from our previous service! Have credit cards? Do you know what the interest rates on each of them are? Make a list (again, Excel works well for this) of the cards, balances, and interest rates. Pay off the higher interest cards first. Watch for better deals or even consider calling your credit card company and negotiating a better interest rate! Keep an ongoing grocery list in a convenient location where all members of the family have access to it. Before you go shopping, plan your meals for the week – what are you going to want to eat and what ingredients do you need to make it? Mint alerts can increase your financial security. I got flooded with 200+ responses to this and yours is one of the most helpful. Thank you SO much!! Wow.Very cool. I’m one of a few in over 200! That sure brightened my morning! Rachael is a reporter and had posted a query to a service called “Help A Reporter Out” or HARO for short asking about a connection between clutter and ‘helping keep love away.’ I had given her some organizing ideas as well as my thoughts on how too much clutter can keep us from finding mates. I look forward to reading her article in the near future. Her website is interesting as well, you can find it here. So…on to today’s topic…My clean and sparkling, super organized office! As I’ve said before, a perfectly clean, everything in its place home is usually an illusion. Everyone has a different level of cleanliness and organization and it is better to find our own personal level and try to keep that in mind. What you see on television, folks, does NOT exist in real life, it just doesn’t. You have to be realistic too. Life gets in the way, we get busy, we stop putting things back into the place we had designated, get something else that crowds the area, or sacrifice staying organized for getting things accomplished. My office and especially the office closet had hit an ‘all of the above’ designation. I got busy, I shoved my boxes of books into the closet, my husband added to it by bringing me a full box of copy paper, and the stack of books I wanted to sell on Half.com seemed to give birth and replicate and begin spilling out of the box I had kept them all in. What a mess! I pulled everything out and took all of the ‘to be sold’ books downstairs, found two empty shelves and even alphabetized them for ease in locating once they have sold. Then I went back upstairs and began pulling everything else that was in the closet OUT. If you thought it was messy before, you will be shocked by the pictures that follow. Now this all might seem rather intimidating. And I’ll admit, for a couple of hours it was. I was amazed at how one small little space could house so much STUFF. The pictures and frames I had stored there ‘just because’ were moved to more appropriate basement storage. The clothing I had hung there ‘to be ironed’ was moved back to my master closet where there is plenty of room for such things (I made that area a wasteland a few years ago by removing all of the clothing and shoes that no longer fit me). I repositioned the boxes of my organizing books into two stacks and found I had room to move the tall, deep black filing cabinet INTO the closet. Should I even tell you about the car load of items that were promptly taken away by my husband to be donated? vy-duty shredder overheated twice and I filled the equivalent of at least seven tall kitchen wastebaskets full of shredded paper (old files I didn’t need anymore) and I still have three phone books left to shred! Desk - Ready for work!